The Joel Frankel Memorial Fund awards small grants, known as Joel Frankel Memorial Scholarships, to assist UCSC undergraduate students with the expenses of field study projects focusing on social change in Latin America or in Spanish-speaking communities in the United States. 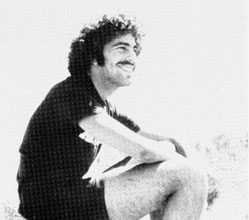 The Joel Frankel Memorial Fund was established to honor Joel Frankel, a 1979 graduate of Merrill College and a Politics major with a strong interest in Latin American and Third World studies. While pursuing field studies in Colombia, he wrote letters about his experiences to the Merrill Field Program and gathered resource materials for the college, where he coordinated a World Studies Table on his return. Tragically, Joel Frankel died of leukemia on March 31, 1982, at the age of 24. Soon after his untimely death, his family (especially his mother, Dolly Arond) and friends created the Joel Frankel Memorial Fund to continue the kind of humanitarian study in which he was passionately engaged. When the Joel Frankel Memorial Fund was initiated in 1982, it was administered by the Merrill College Field Studies Program. When this program was discontinued in spring 1993, the college asked the Latin American and Latino Studies (LALS) Department to take responsibility for the administration of the student awards funded by the Joel Frankel Memorial Fund. Although LALS has administered the student awards since fall of 1993, the Joel Frankel Memorial Fund remains a Merrill College endowment. The Joel Frankel Memorial Fund awards small grants, known as Joel Frankel Memorial Scholarships, to assist UCSC undergraduate students with the expenses of field study projects focusing on social change in Latin America or in Spanish-speaking communities in the United States. While undergraduates in any department are eligible for these awards, priority is given to Merrill College students and Latin American and Latino Studies majors. Award recipients make a presentation to the Merrill community, contribute written work or audio/visual materials to the LALS Department, and submit a summary of their field study. In the decades since Joel Frankel’s passing, the fund created in his honor has supported Joel Frankel Memorial Scholarships for well over 100 outstanding UC Santa Cruz students. For more information about these scholarships, please contact the undergraduate advisor in the Latin American and Latino Studies Department at (831) 459-2119 or visit the department's website.